Ever get on a subway without your hand sanitizer and — upon realizing your terrible error — felt certain you would inevitably contract a virus that would make you patient zero in an apocalyptic pandemic? Well, if you’re one of the few who haven’t had a thought like that, this new campaign for Purell and Michael Bay‘s new post-apocalyptic TV drama will enlighten you. New York commuters have been greeted at the Grand Central Terminal this week by an eye-catching hand-sanitizing station that boldly states, “1 virus. 6 billion dead. 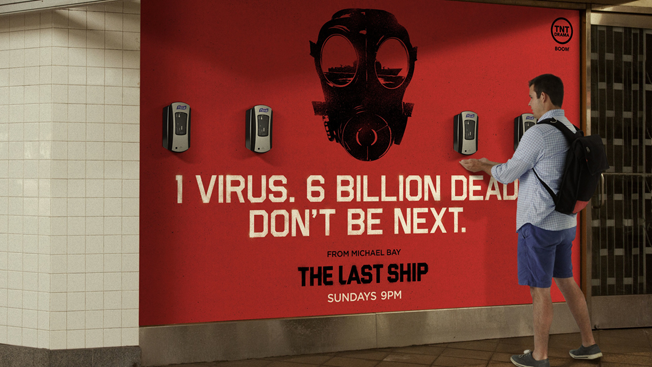 Don’t be next,” urging folks to clean up lest they meet a similar fate to the fictional billions who die in Bay’s new TNT show “The Last Ship.” The series will focus on a U.S. Navy destroyer fighting to save what’s left of humanity. We imagine there will also be plenty of explosions and slow-motion action scenes (it’s Michael Bay after all). Of course, New Yorkers are no strangers to over-the-top marketing tactics — just this year alone they’ve been chased by a raging bear in search of yogurt and attacked by a demon baby in a runaway stroller, so maybe germs are the least of their worries.